I really don’t have the heart to write about the end of an era. Many others are quite prolific in their opinions — both pro and con. 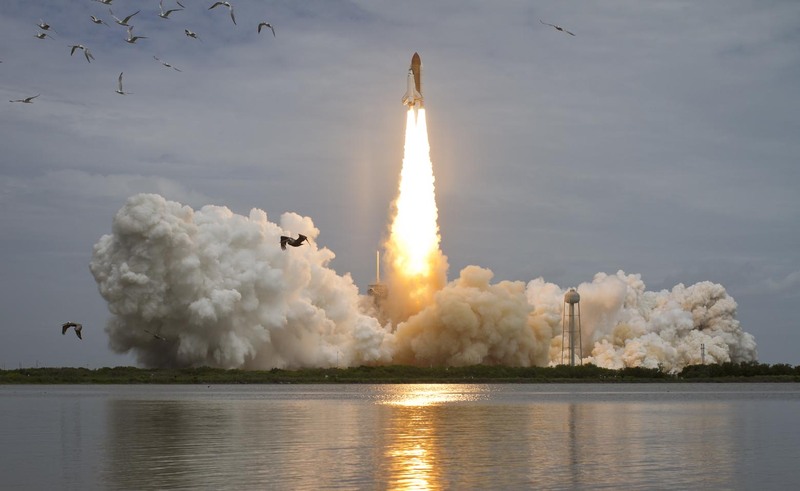 I simply want to celebrate the coming together of NASA employees, families, friends, fans, as well as all the new tweetships forged at the Kennedy Space Center during the picture-perfect STS-135 Space Shuttle Atlantis final liftoff. 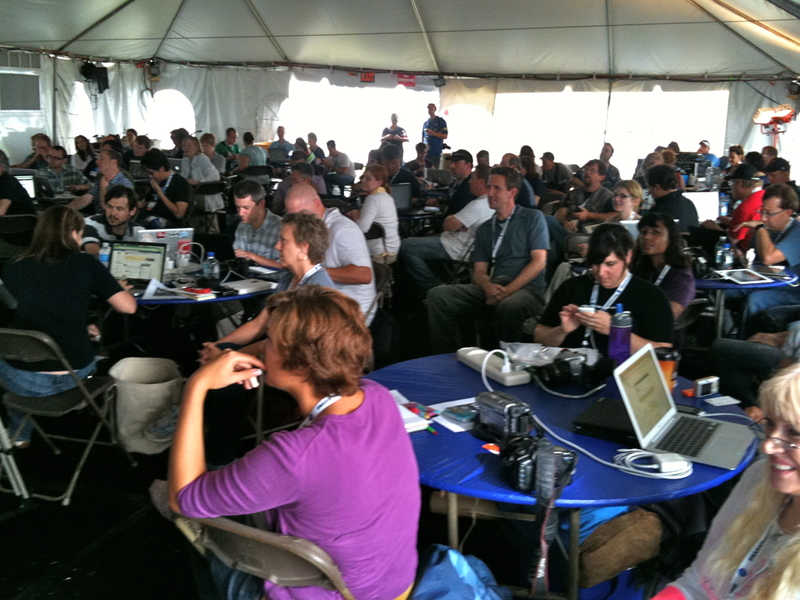 The weather outside couldn’t dampen the spirits INside the NASA tweetup TWent. 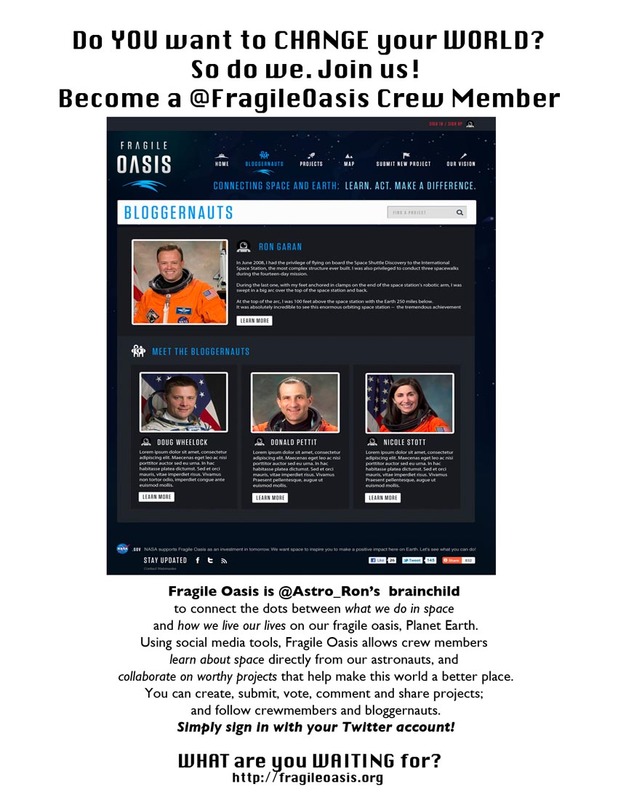 Space tweeps, who know each other virtually, get to “meetup” for the first time. Great speakers. NASA’s Deputy Lori Garver kicked off the festivities. Then our special guest, Elmo from @SesameStreet, interviewed astro-tweeters @Astro_Mike Massimino and Doug @Astro_Wheels Wheelock. 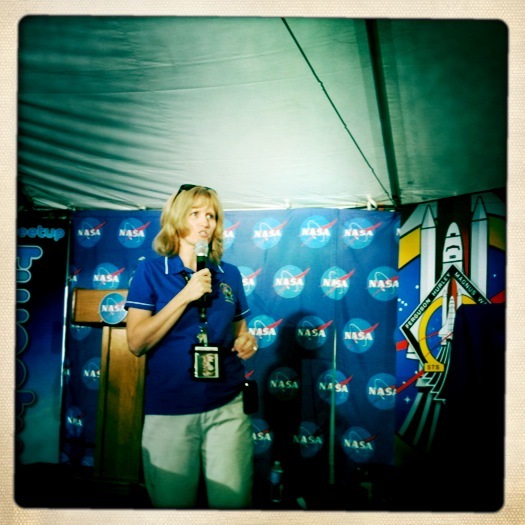 NASA Deputy Lori Garver addresses space tweeps to kick off the formal tweetup event. 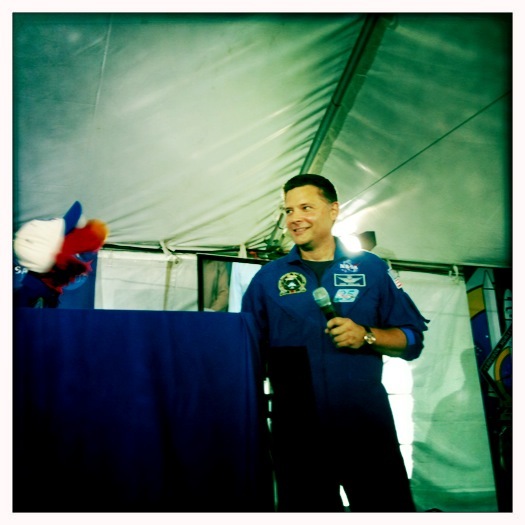 Elmo tells @Astro_Mike he wants to be a teacher. 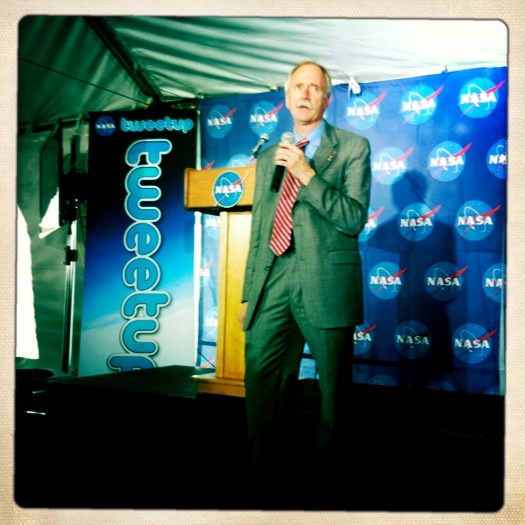 Next up: Bill Gerstenmaier, my boss and head of NASA’s Space Operations. He approves the funding to host mission tweetups, so give it up for Gerst. Virtual standing ovation! He gave us a state of the mission update, then the deluge trapped him in the TWent with us. Angie Brewer, Kennedy Space Center’s Atlantis Flow Director, talked about her beloved Orbiter. We also learned about Space Station research and the new National Lab concept from Tracy Thumm @ISS_Research and Justin Kugler @ISS_NatLab. We draw a crowd. The press come in and out of the TWent — our ever present TWaparazzi. 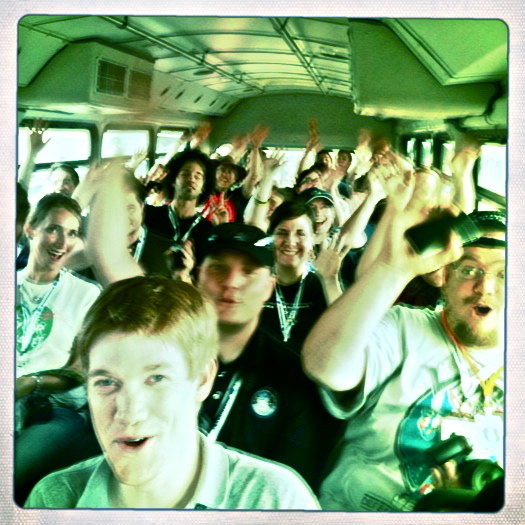 On our way to the VAB, @Astro_Ron Garan called from Space Station to say hello to the tweeps! Yes, you read it right. Ron called from space! The tweeps had just enough time to shout out their greetings before the call went out of range. Too cool for words. Right tweeps? 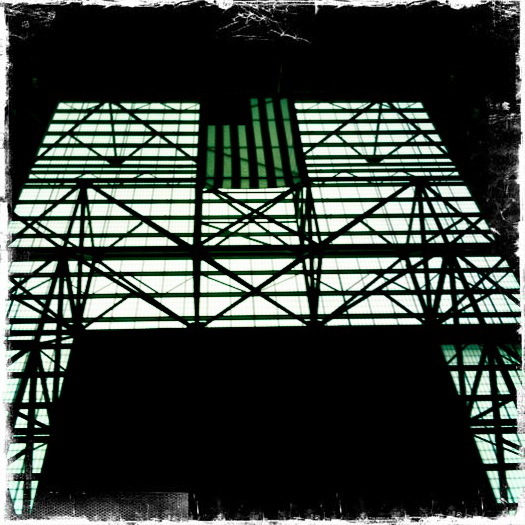 Inside the VAB, I always get emotional looking at the flag hanging from the top. 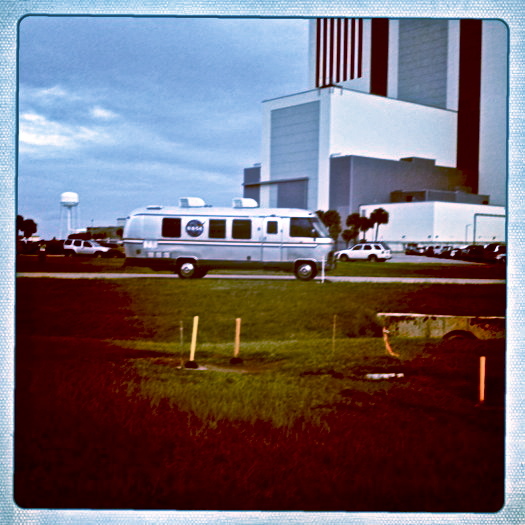 Next, we headed out to the launch pad to watch the Rotating Service Structure roll back from Atlantis, in preparation for launch. We’d heard the roll back was delayed due to weather, so I was pretty bummed…until, voila, Atlantis started peeking out from behind the structure. Wow. Atlantis in all her glory. Here we are in front of of the last Space Shuttle before her liftoff on the last Space Shuttle mission. Many thanks to NASA’s photographer, Paul Alers, who graciously agreed to take our picture, even though it wasn’t on his to-do-list. Overnight I slept with my iphone next to me. All night I checked for scrub email. Nope. Not a one. I left the hotel at 4:20 a.m. but I still didn’t beat the tweeps to the tent. 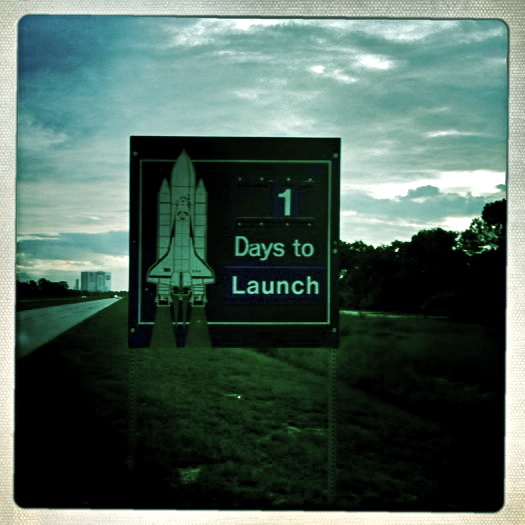 Take a look at Atlantis on the pad via Sarah Horst‘s twitpic. We had a steady stream of speakers all morning. NASA’s Deputy @Lori_Garver came back to chat; along with Laurie Leshin, Deputy of the new Human Exploration and Operations Office (we’re merging Exploration Systems and Space Operations); Chief Technologist @Bobby_Braun; STS-132 Pilot Tony Antonelli, and ROCKet star, Bob Crippen, STS-1 pilot, my former boss. I was running around, so I missed some of the drop ins. We posed for our group portrait by the launch countdown clock, then headed out to see the crew in the astrovan on their way to the launch pad. No U-turns this time! 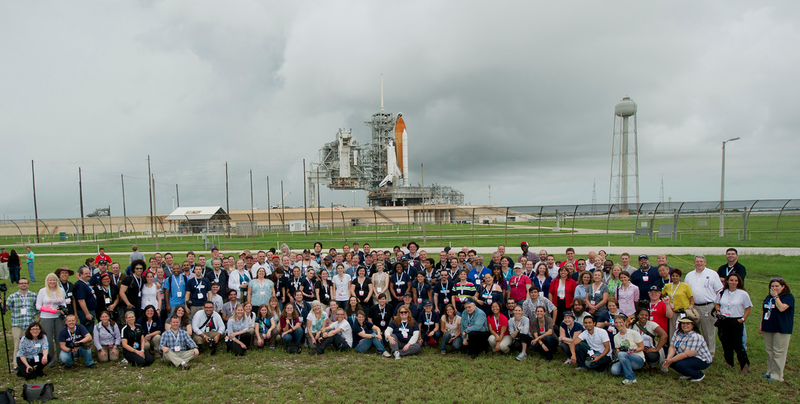 Astrovan with STS-135 crew. No U-Turns! So many highlights to share from this historic event. A real tear jerker for all of us was the debut of Shuttle Fanfare, composed by Battlestar Galactica’s Bear McCreary through the teamwork of Seth Green, Mike Dougherty, and NASA. Seth introduced the tribute theme song for STS-135, and explained that he’s working on a Blog-umenary for the Fragile Oasis website detailing the process to create the song. 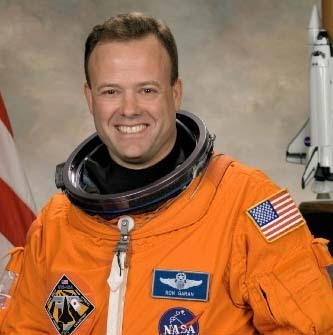 @Astro_Ron Garan called again from Space Station just before launch. This time I passed around my iphone for the tweeps to take to Ron individually. Quite a rush!! We’re hoping to compile a transcript of what everyone talked to Ron about. 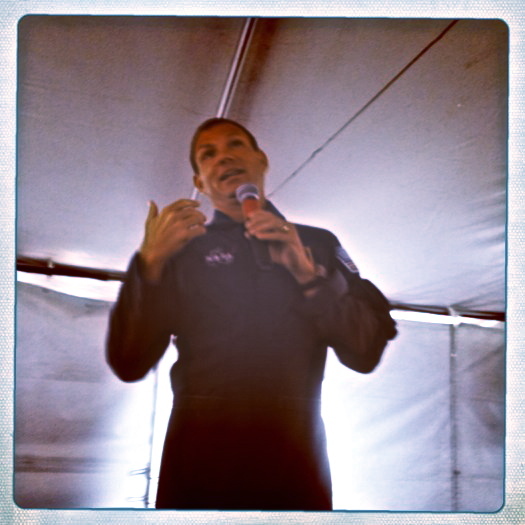 But even as awesome as it is to talk to space, the star of the show was Atlantis herself. What an amazing vehicle. What an incredible legacy. The press site was crawling with humans and cameras. I wasn’t at NASA in the beginning of the Shuttle program. 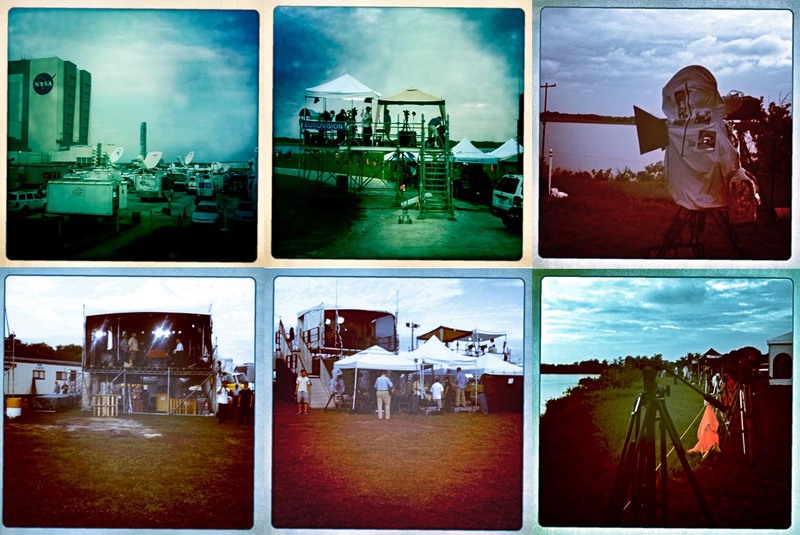 I’d never seen so many satellite trucks and viewing platforms. I’m thankful Atlantis drew a crowd. She deserved it. 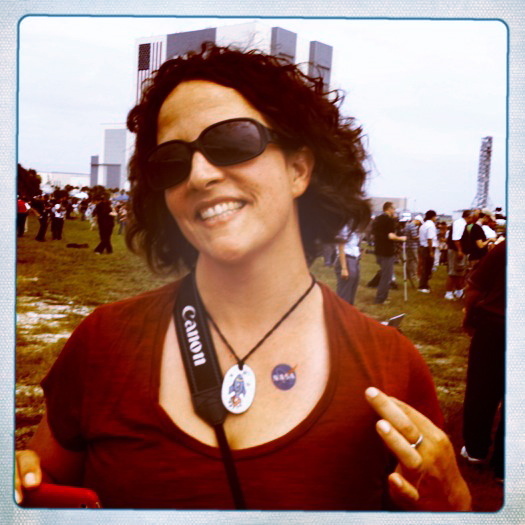 This photo of Karen James, STS-133 alum, paints a portrait of passionate enthusiasm we all felt. But we weren’t the only ones watching Atlantis leave this planet for the final time. The Expedition 28 crew onboard Space Station were glued to their screen. No, it's not Sunday football. Expedition 28 crew watching Atlantis liftoff. 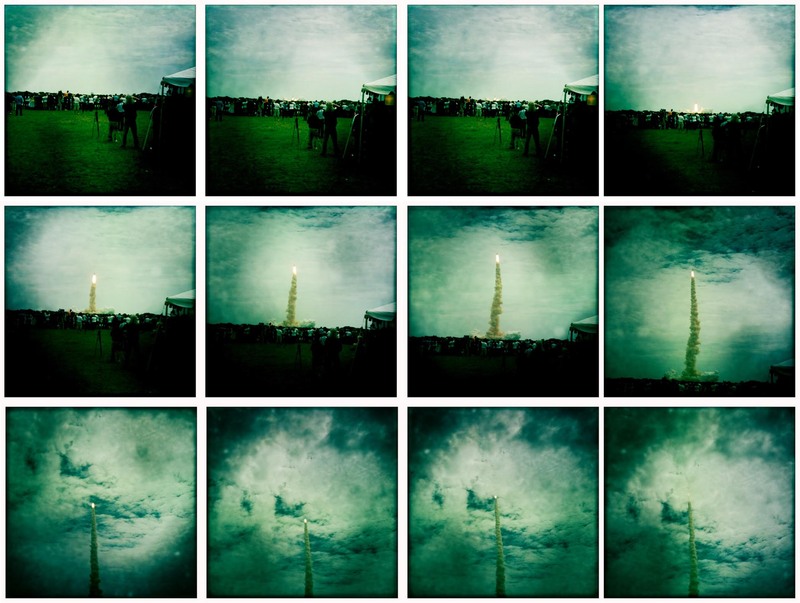 Here is my launch collage of Hipstamatic images of Atlantis breaking the bonds of gravity. Collage of my iphone images of Atlantis leaving Earth. @KelleyApril + @glancz jumping for joy! Big takeaway: We turn dreams into reality. Let’s go boldly into the future together. For now, if you want to help make this world a better place, join Fragile Oasis and submit your own project. 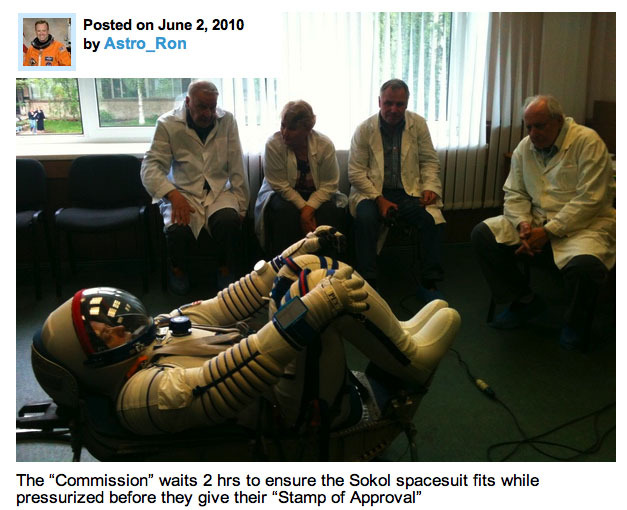 Founder and chief Bloggernaut @Astro_Ron is waiting to hear from you!! Mashable.com is hosting the 3rd Annual Open Web Awards Social Media Edition. Pete Cashmore set up awards that ensure we keep the buzz going linking back to his site. Brilliant! We can nominate our favorites in multiple social media-related categories. The catch: we nominate once a day in each of the 50 categories through November 15th…AND only the top five nominations in each category move forward to the voting round. Basically, the nomination period is a semi-final round. 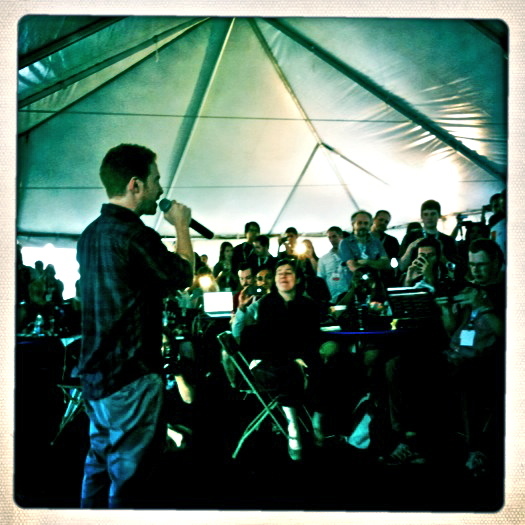 Mashable ensures users return to his site day after day, and tweet their results. Great PR for Mashable. He’s creating a social media frenzy by rewarding the social media frenzy. Like I said, brilliant. Gotta’ love Pete. Wish we had him on our team! With the few days left for nominations, I thought I’d share a couple of NASA-related choices (plus one or two). Tweet from Space by Tw-astronaut @Astro_Mike Massimino. Tweet about life after space by @Astro_Mike. Twitter User of the Year: @Astro_Mike — over 1 million followers! Most Inspiring to Follow: @Astro_Mike. Best Brand Use of Twitter: NASA. Best Brand Use of Facebook: NASA. Best Brand Use of YouTube: NASA YouTube. 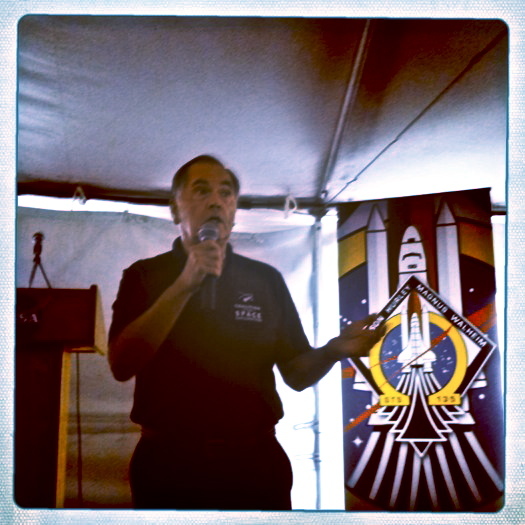 Best Online Video Web Series: Mike Massimino’s “NASA Behind Scenes” series. 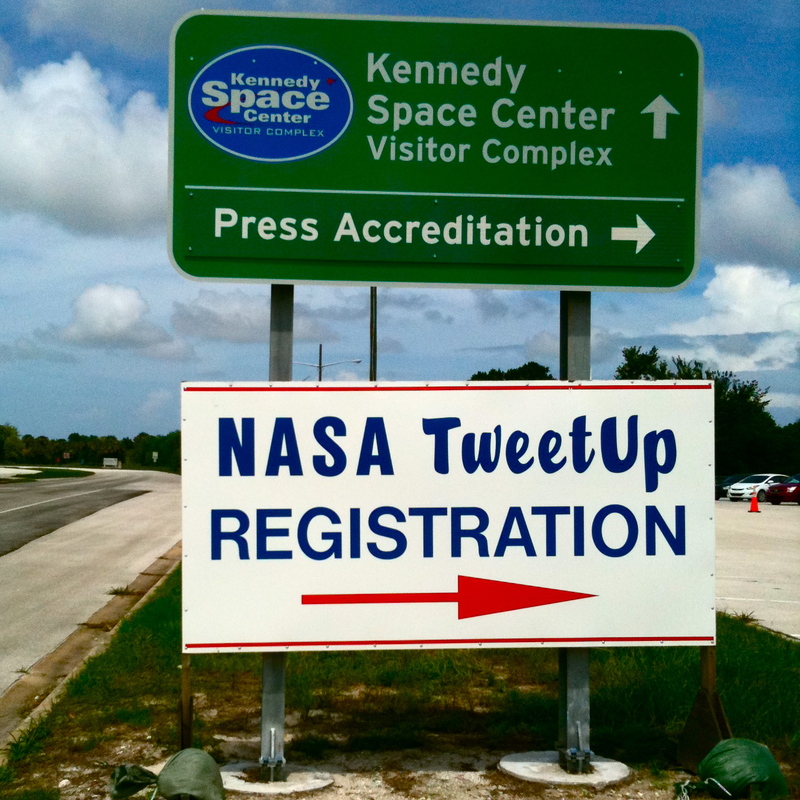 Best Non-Profit Use of Social Media: NASA + Space Tweep Society + OpenNASA. 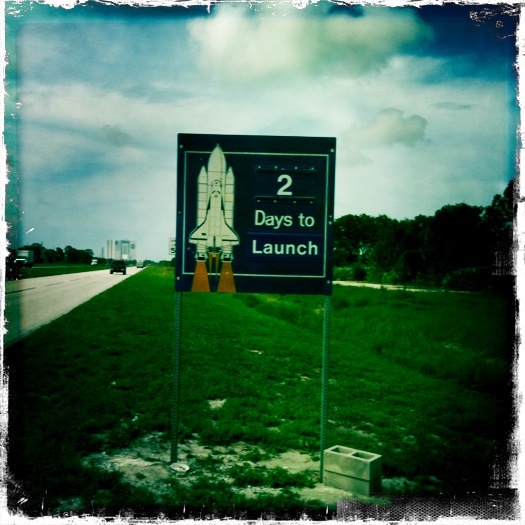 Call to ACTION: You only have a few days left to give space a chance in the universe of social media. Make your voice count.